If you live in a tornado-prone area, it’s advisable to post tornado signs that direct workers and visitors alike to safe shelter. Tornados and break out suddenly and sometimes even without notice. Protect yourself and those around you by posting a tornado sign that communicates where to find shelter in the even Mother Nature strikes. At Seton, we offer may tornado shelter signs that help get the job done, including bilingual signs. 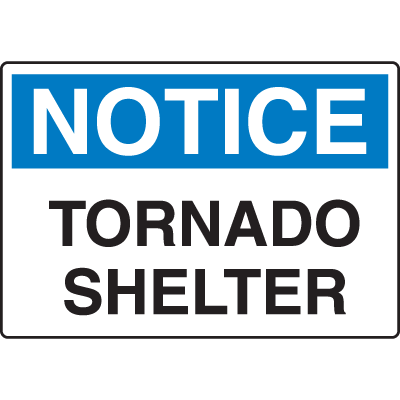 We even offer a Harsh Condition OSHA Sign – Tornado Shelter that is not only compliant with OSHA regulations, but it’s also designed to stand up to tough conditions associated with tornados. Post tornado signs around your facility to stay prepared in the event of a tornado sighting. A tornado can strike at almost any time, and in any place. 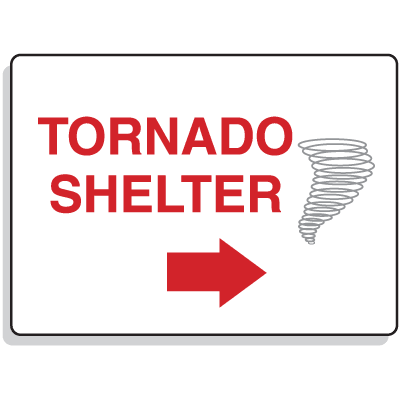 Keep your facility prepared by posting tornado signs that direct workers to the nearest tornado shelter. 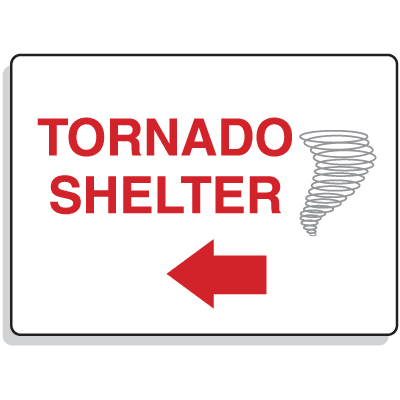 At Seton, we offer several varieties of tornado signs and tornado shelter signs. These signs not only provide directions, they also help reduce the impact of panic on your workforce. Post a tornado sign with directional arrows in a logical pattern to lead workers, and in some situations even visitors, to the nearest shelter. Choose a bilingual tornado shelter sign that says “Tornado Shelter,” in both English and Spanish to ensure your entire workforce know the way to safety, or an OSHA tornado sign to maintain compliance.